The burnt-out shell of Sammy’s is littered with bodies, the result of a ritual sacrifice gone wrong. It’s up to Lincoln Clay, Father James – and you – to unravel the clues and free a woman from the grips of a bloodthirsty cult. “Sign of the Times” is a dark trip into the drug-induced underbelly of New Bordeaux. What can you expect out of “Sign of the Times” when it arrives on July 25? Keep reading to learn all about the third installment of Mafia III’s Season Pass content. “Faster, Baby!” had you ripping through rural Sinclair Parish with high-speed chases and stunt driving. “Stones Unturned” took you on an explosive buddy action adventure with John Donovan by your side. Now, as a mysterious cult surfaces in the city, “Sign of the Times” draws you into a creepy game of cat-and-mouse that feels more like a 1960s-inspired psychological thriller. There’s a few new gameplay elements introduced, as well as gear to earn and cars to add to your fleet. The inspiration for “Sign of the Times” is pretty clear. The late 1960s was a time of social and civil unrest – which we cover extensively in the game – but also of hallucinogenic experimentation and crazed cults, the horrible memory of the Manson Family being the most infamous. We were inspired to tell a story that represented that element of the time period, which led to The Ensanglante you tangle with in New Bordeaux. I see each of the DLC stories as three different journeys for Lincoln and how he’s wrestling with his own grief and finding a way forward. You have someone like Lincoln who felt powerless in stopping the betrayal early in the game. In “Sign of the Times,” you have him finding someone who needs help – that’s not able to put the pieces of the puzzle together – and he can actually do something for her. Part of it is seeing himself in that character – Anna – and the common ground of going through traumatic experiences. This isn’t some quest for revenge or redemption, but Lincoln tries to find some kind of peace for her that he’s not able to find for himself. There’s definitely a different feel for this part of Lincoln’s story. It’s more internal, there are points you’re hearing Lincoln talk to himself as he hunts for clues. More importantly, he’s not in full control of this situation – and there are times when he won’t even know what’s real and what isn’t. Unlike the one-man war that Lincoln wages against the Marcanos, he doesn’t have an inside line. No knowledge of The Ensanglante or what they do. He’s trying to piece things together at the same time as the player. From the moment that the “Sign of the Times” DLC kicks off, you’re in for more deliberate pacing. There’s a mystery to solve with Lincoln searching for stray objects left behind, strange writing – you’ll even examine bodies for clues. By eyeballing the environment and using a blacklight flashlight to uncover hints, you’ll zero in on where The Ensanglante operate and what the hell their endgame is for New Bordeaux. At key points in this DLC, we have these investigation zones where you’ll methodically look for clues that reveal more of the truth… and it can quickly turn a corner where you’ll be dealing with cult members in tense firefights. There’s crazed, knife-wielding cultists that will taunt you and jump out from nowhere. Not to mention throwing knives you’ll be able to silently hurl back at them. As you scour new locations inside New Bordeaux city limits, you’ll also fight off well-armed psychopaths as they attempt to slow down your search. Speaking of slowing down, “Sign of the Times” introduces slow-motion gunplay. Once triggered, you have a few extra seconds to take down enemies. However, for those able to skillfully pull off headshots, you’ll extend the slow-mo timer – so take aim! Season Pass Owners: Don’t forget that “Sign of the Times” is part of the Season Pass. 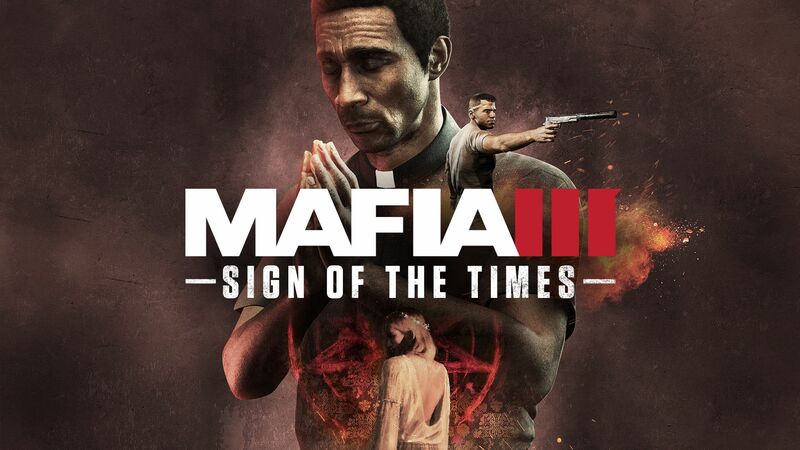 We still have more to share about this DLC in the short time before it hits digital stores on July 25, so keep your eyes peeled for more Mafia news on our Facebook, Twitter and YouTube channels.